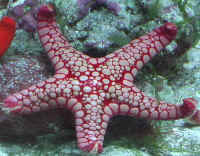 I have an established, stable (9 dKH, 420 ppm Ca, 1400 ppm Mg, 78F, 1.025 salinity, 2-3 ppm NO3 and low PO4) quarantine with sps and various inverts including an Echinaster sea star. Lighting is LED and the majority of the sps are doing well - improving coloration and growing with the exception of a few frags that are mysteriously RTN'ing. No Alk, temp or salinity swings or contamination,. 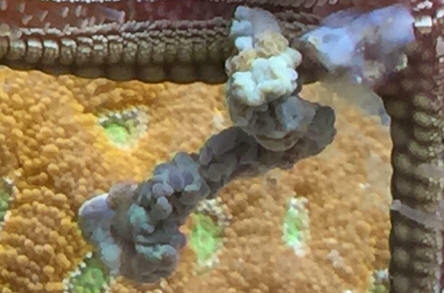 I have found the sea star on some of the affected frags and what possibly looks like munch marks, could it be the star to blame? Or could the star be attracted to stressed sps? i think i have found who has been eating my hammer head and frogspawn.. i can be wrong but i think not. can you confirm my suspicions?. 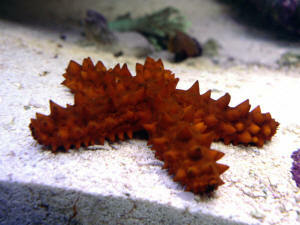 it looks like a piece of hammer head coral dangling from the starfish. <Don't see references pointing to Nardoa novaecaledoniae feeding on corals in the literature though. i was told they are reef safe but this shows different. I am going to isolate him and see what happens. thanks for the quick response. i truly appreciate it also your knowledge. I noticed my orange knobby starfish eating my Staghorn coral crab. It has never eaten one of my living inverts before that I've noticed but we did have a clam mysteriously die. Could he have done that? Also, is it common for this type of starfish to eat living things in the tank? Red Thorny/Knobby Star (Echinaster echinophorus) Best Left in the Ocean. 2/22/07 Hi Bob, <Hi K.B.! Mich with you tonight.> My compliments to you and your staff for the great job you do and your dedication to education with regard to marines. <Thank you for your kind words. It is nice to be appreciated.> Quick identification question for you. Attached are a couple pics of a red thorny/knobby star that I'm told is reef-safe. I've searched the web for this star and have found many similar but cannot confirm its species. 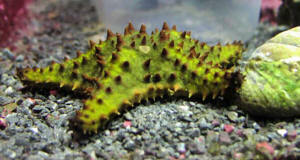 Would you be so kind as to identify the species and whether or not it is reef-safe? <Does appear to be Echinaster echinophorus which has a poor survival rate in captivity. It is believed that the natural diet is comprised of sponges, but have read reports of it eating meaty foods in captivity. Reports to be reef safe, but short lived.> Many, many thanks. Re: Red Thorny/Knobby Star (Echinaster echinophorus) Best Left in the Ocean. 2/22/07 Thanks Mich. I found what I thought was this star in my research, and I trust now that it was judging by the information you provided here. <Glad to help.> Thanks again.